When I met with Scality CEO Jerôme Lecat last week, he was at pains to ensure that Zenko – the company’s latest software product – wasn’t described as a storage gateway. Jerôme sees gateways as protocol conversion devices, which as we will discuss is definitely not what Zenko is about. So what is it exactly? 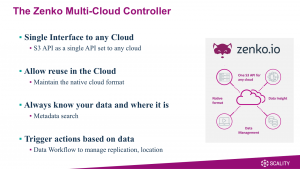 Scality describes Zenko as a multi-cloud data controller. The best way to think of this is as an object store abstraction layer that allows data to be written to a logical object store address and have the physical data stored across multiple locations, including private object stores and the public cloud. If not a gateway, then Zenko is perhaps a gatekeeper. When is a gateway not a gateway? With the ubiquitous nature of object store protocols (being HTTP-based), what benefits are there in placing another layer in between the client and the data? Well, here’s where things blur a little when we talk about what a gateway actually does. Zenko provides the capability for applications to store their data using the de-facto S3 API standard used on AWS. However, at the back-end, Zenko can talk to a range of object store solutions, including Microsoft Azure BLOB storage. Zenko therefore acts as an API translation layer, but doesn’t actually change the format of the content itself. So data written using Zenko to (for example) Azure BLOB storage can still be read directly in Azure. This means that applications don’t need to be rewritten to handle multiple APIs in order to get the benefit of multiple clouds (public or private). There are other benefits of course. With all the data passing through the Zenko Controller, security settings can be standardised (and eventually integrated with native security on the back-end platforms). Metadata remains in Zenko, so although data can be dispersed across many locations, metadata is searched in one place. Efficient metadata searching is a key requirement of all object platforms it becomes a challenge to amalgamate the results across many providers who use different API definitions and output formats. Zenko manages search with a component called Clueso (which could be a play on words between Cluedo and Clouseau, I’m not sure). Clueso enables the user to query object data using an Athena-style interface – Athena is the AWS component for doing SQL searches on S3 data. During a presentation at Technology Live! last week, Scality chief engineering architect Brad King demoed Clueso with Zenko and the results were pretty impressive. Backbeat is the Zenko workflow component that manages replication and tiering. With Backbeat, users can set policies that determine where data is placed across the physical infrastructure. Migrated data is moved asynchronously in a similar way how tiering migration would work in S3. We can imagine scenarios that allow data to be moved between tiers of storage for cost purposes, but also to provide cross-cloud protection where the impact of the cloud provider going down becomes a problem. 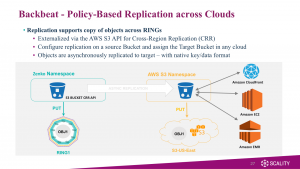 As this doesn’t happen very often (although it has happened), replication may more likely be used to provide faster (lower latency) access to data or to move content between cloud vendors to take advantage of specific analytics features of a cloud platform. As a community effort, Scality should be applauded for their efforts with Zenko. We will need tools to manage data in a multi-cloud world and in many respects object storage is one of the easiest to tackle. Leaving data intact means IT organisations can try Zenko without much risk as the software can be removed without losing data or having to go through extensive “exit” processes. What wasn’t initially clear to me was how Scality intended to make money from the work they have done. However it looks like the plan will be to introduce an Enterprise Edition that has scale-out capabilities and a wider range of features (such as NFS/SMB support). How will the market take to this? For cloud vendors like Azure, Zenko gives instant S3 compatibility, so I’m sure they will be pleased. For everyone else, the risk is for data mobility to reduce their offerings to a pricing war. If object stores are seen simply as a repository for data, then competition all comes down to cost. However that’s not where the market is going, with competing vendors like Caringo and Hitachi (plus others) expanding their solutions with file interfaces and other ecosystem support. I’m looking forward to trying out the software for myself as I also need to spend time working in and with Azure; this gives me the excuse and opportunity. Let’s see if the adoption of Zenko can replicate that of Scality’s S3 Server, which with 500,000+ downloads/pulls seems to be continuing to gain in popularity. Zenko is open source. You can find out more at http://www.zenko.io/ or https://github.com/scality/Zenko. Copyright (c) 2009-2017 – Post #8c44, Chris M Evans, first published on https://blog.architecting.it, do not reproduce without permission.